Overall this is a very nice kit. There are only 31 parts in total, making it quite simple to put together. The plastic is a dark grey and fairly soft. Fit is reasonable though all the joining surfaces for the body panels will need some sanding to get a better join. Even with that I found there were the odd places where I had to apply some filler and sand. This must be done very carefully so as to not remove too many rivets. The kit was basically built straight from the box, with a few minor modifications to make it a bit more accurate. 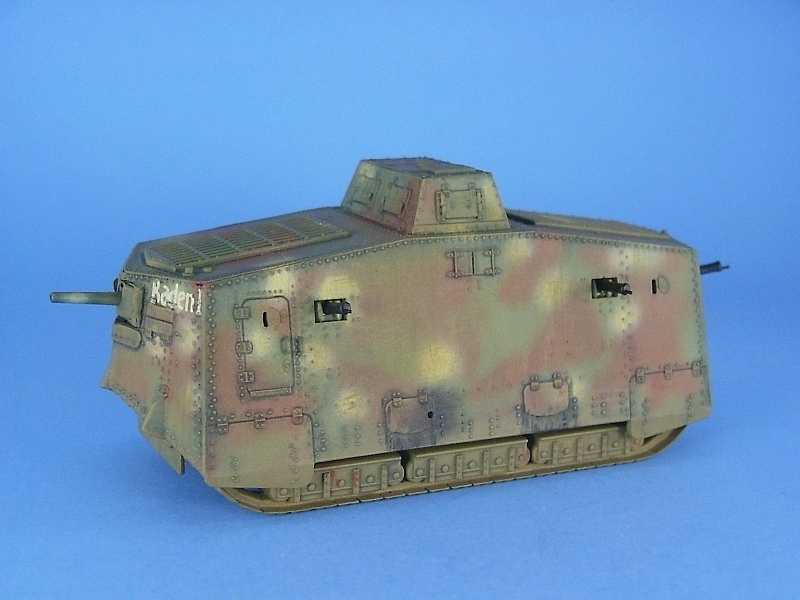 The Landships web site provides a some good info on the A7V and was quite helpful in identifying the changes. I was also able to get my hands on a copy of the excellent book, “The German A7V Tank and the captured British Mark IV tanks of World War 1” by Maxwell Hundleby & Rainer Strasheim, published by Haynes Publications in 1990. This book is a must read for anyone who has an interest in the A7V and captured British Mk. 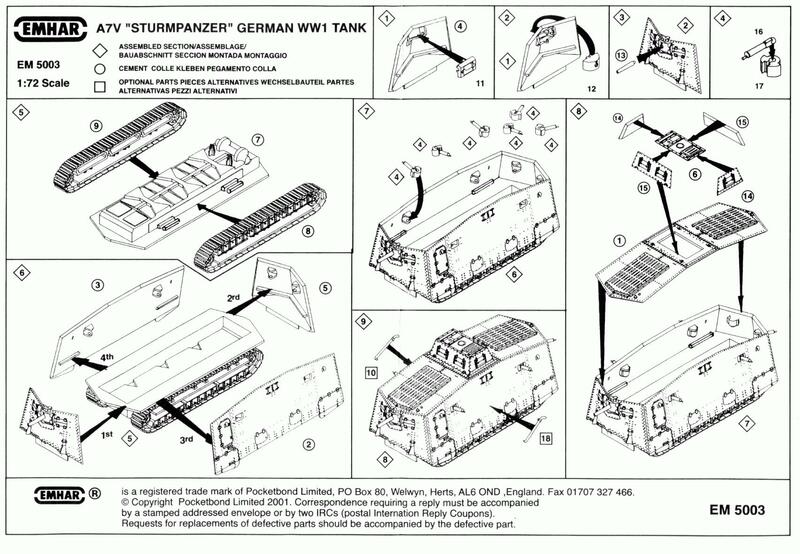 IV tanks used by the Germans, and even more valuable for the wealth of pictures and history on the A7V and its kin. From my references I found that the early A7Vs did not have exhaust pipes nor the foot steps beneath the doors, so the exhaust pipes (parts 10 & 18) were not mounted and were tossed into the spare parts box, while the molded on foot steps were shaved from the body’s side panels. My kit had a prominent seam on one of the track units that I tried to remove as best as I could without creating a flat spot along its length. The rear faces of the bogie units (parts 8 & 9) are molded hollow. I covered these over with some plastic sheet and built up the assembly to resemble the front side of the bogies. I didn’t put too much detail on these as they are mostly out of sight when the tank sits on the ground. The teeth molded on the front idler wheels were removed. I also added axles from some plastic rod between the drive sprockets on the bogies and the transfer case at the rear of the body pan (part 7). The barrel for the forward gun (part 13) was drilled out. Take care while assembling the front gun mount as shown in Steps 1 and 2. The instructions direct the builder to put the mount in backwards. I didn’t notice this until I had glued it in place. Then I had to cut it out of the hole in the body and put it in the proper way. The machine guns are molded so as to be moveable. Since I had no desire to have moveable guns, all of the machine gun mounts (part 17) were glued in place to the body panels to ensure there was no chance they would fall into the body when I added the guns later. To ease construction I cut excess plastic from the small balls located on the rear of the machine guns so I could slide them into place in the gun mounts and glue them after all the painting was complete. Replacement door handles were fashioned from some thin wire. Decals are not the best but are usable. 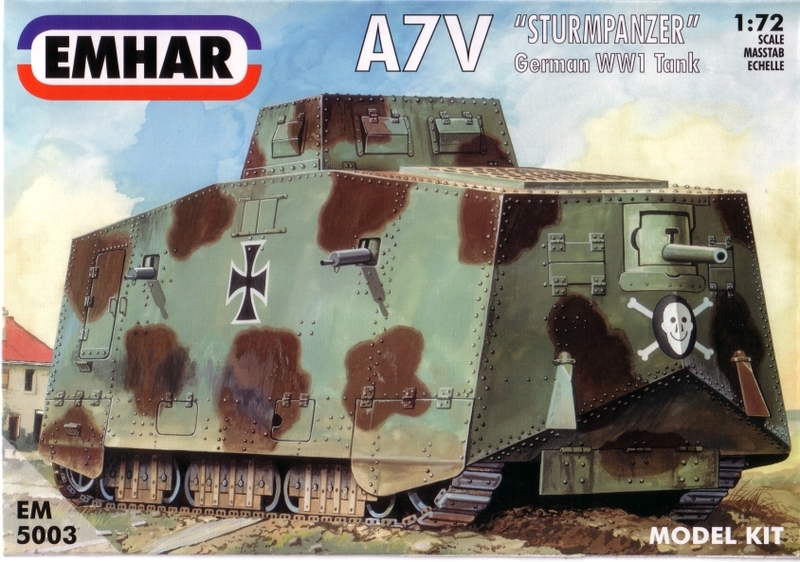 The white on the images is a dirty off-white and not a nice pure white, plus the vehicle names are bit too large compared to what is shown in the A7V photographs I found. The decals did snug down well after a few applications of Microsol. For markings I went a different route than suggested in the instructions. The Hundleby & Strasheim A7V book contains a couple of pictures of A7V ‘Baden I’ just after the battle of Villers-Bretonneux and Cachy in April , 1918. In one of the photographs “Baden I” displays no German Iron Cross markings of any sort, which I felt would make for something out of the ordinary, and I just had to finish the kit with these markings. Below is a historical look at the history of “Baden I’ that I was able to extract form the Hundleby & Strasheim book. 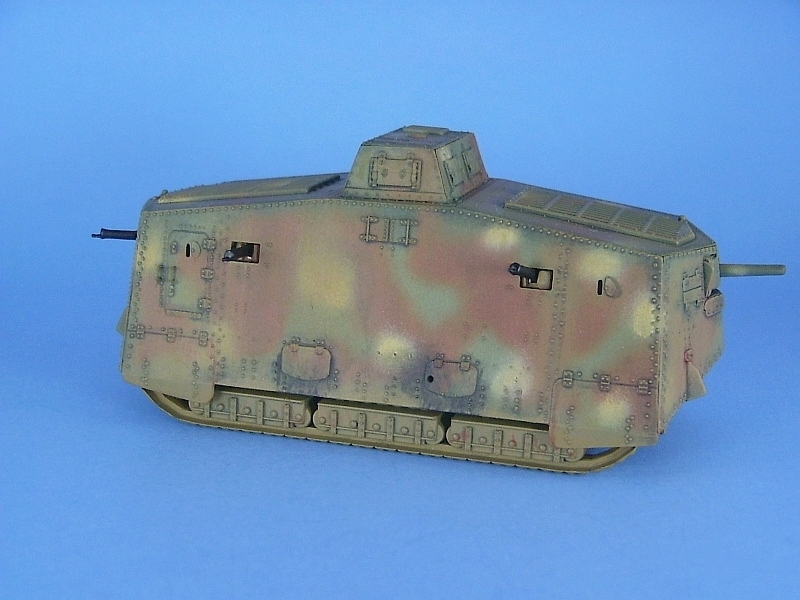 Tank Commander: Lt. Voss, Abteilung 1.
the German wire defenses and stalled. Attempts to get the tank running again failed and it did not participate in the battle. Tank Commander: Lt. Bürmann, Abteilung 3. Tasked to advance west in support of Reserve Infantry Regiment 93 in taking the southern edge of Villers-Bretonneux and the northern part of the Bois D’Aquenne. Starting at about 07:00hrs the advance was successful and 505 was able to get to the west side of the town. At about 10:40hrs while 505 was advancing along the Roman Road approaching its junction with the Fouilly to Cachy road it received fire from a British field gun which fired three shots. The first shot missed, while the second shot hit forcing 505 to retire. The third shot was a near miss. 505 returned to the field between Villers-Bretonneux and the Bois D’Aquenne, joining sister tanks, 541 commanded by Lt. Block and 507 ‘Cyklop’ commanded by Lt. Hennecke. Later in the afternoon 505 was released and returned to base and eventually returned to the repair shops to have the damage inflicted by the British field gun fixed. Tank Commander: Lt. Lappe, Abteilung 3. Assigned to support 227th Infantry Division in their advance on Orvillers and Biermont, 505 initially became stuck in a trench but was hauled out by 507 (commanded by Lt. Fritsch) and then advanced through Biermont and the Bois de Hagrand towards Bois de Sechelles. (of the 227th Infantry Division) south towards the Bois de Ressons. Heavy fire forced the attack to turn back. Eventually 505 returned to the assembly area. Following the battle 505 was returned to the repair shops to fix battle damage and to receive a conversion for an updated front gun mount. Tank Commander: possibly Lt. Lappe, Abteilung 3. Assigned to support Jägerregiment 8 of the 195th Infantry Division. 505 along with all the other tanks of Abteilung 3 were unable to cross the River Arne because it was twice as wide as reported before the attack, and the only bridge to cross the river hand been blown up 24 hours previous. 505 along with the other tanks then provided supporting fire across the river during the attack. Afterwards 505 returned to the repair shops. 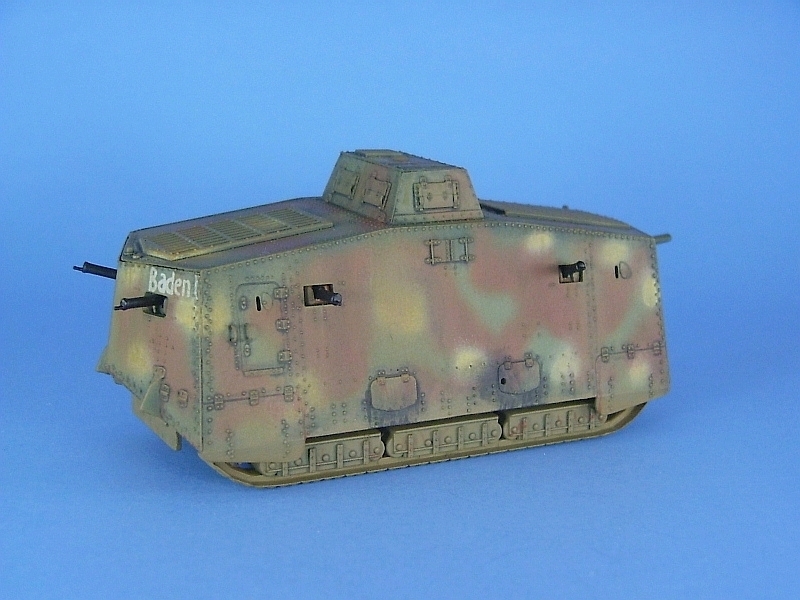 By November the German Army was in retreat and 505, along with the other A7V survivors were shipped to Wiesbaden-Erbenheim, Germany, where they were eventually seized by the French in mid-December 1918. It is believed that all the A7Vs were then scrapped on the spot.